According to the Export Development Board (EDB), during the first four months the country has achieved $5 billion export earnings, compared to $4.7 billion recorded in the corresponding period last year. The total merchandise exports increased to $3.7 billion from January to April 2018, compared to $3.5 billion in the same period last year. “Merchandise and services exports are expected to grow by 15% from 2018 to 2020 with European Union GSP+, growth in National Export Strategy (NES) focused sectors, favourable impacts from free trade agreements (FTAs) and US GSP; while from 2020 to 2025, merchandise exports are expected to grow at a stable rate of 10% annually,” EDB Chairperson Indira Malwatte told the Daily FT. 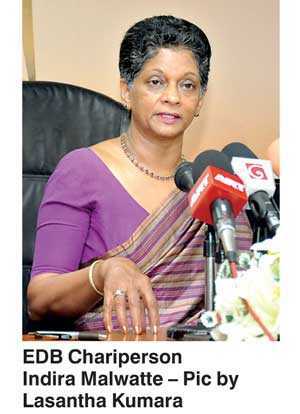 Giving a breakdown of the sectoral performance during the first four months, she said the apparel sector recorded $1.6 billion out of the total target of $5.2 billion, tea sector recoded $472 million out of the total target of $1.6 billion, food and beverages sector has recorded $127 million of out of the total target of $449 million, rubber based sector has achieved $295 million of the total target $1 billion and electronics and machinery sector has recorded $130 million out of the total $427 million. Although the apparel sector has not performed favourably in the month of April, she expressed confidence that the sector would catch up in the coming months and achieve their target. She however, was concerned for the spices and essential oils sector that has not accomplished well in the first four months. Spices and essential oils has recorded $95 million in the first four months out of the total target of $550 million. “The sector is undergoing an issue in pepper exports. We are in the process of addressing the issue with relevant stakeholders and authorities in India at present,” she added. Malwatte expressed confidence on achieving this year’s set targets.